Grand Turkmen Hotel is set in close proximity to the city centre, near Independence Monument, Carpet Museum and National Museum. Convenient transport routs connect the hotel with international airport and railway station. 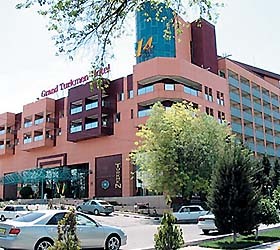 Each of the 120 well-furnished rooms of Grand Turkmen Hotel has a balcony and a bathroom. The room categories are the following - 72 Standard Twins, 24 Standard Doubles, 20 Suites and 4 Presidential Suites. The rooms are fitted with modern amenities - air conditioning, IDD telephone, mini bar, satellite TV. Each guest has complimentary access to breakfast buffet every morning. Guests can conclude a day full of business meetings and sightseeing at one of the hotel's leisure facilities. Bars, casinos, nightclub and wellness centre with sauna, swimming pool, gym, fitness centre, massage and medical office, - are all at their disposal. Among the other Grand Turkmen Hotel facilities and services - secured parking, safety deposit box at front desk, currency exchange, laundry and dry-cleaning service, taxi call, gifts shop.